In Mark 2 we read about a small congregation of friends who were eager to bring someone into the house where Jesus was. 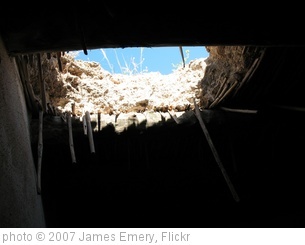 Getting through the barriers required an act of demolition:digging a person-sized hole through the roof. Something like that happened at Morton Church in 2005. Assisted by a few professionals, the church members completely gutted the two-story wing of the building, totally reconfigured it, and added an addition with a new kitchen and wheelchair accessible restrooms. The whole facility is now on one level. It was a major step towards accessibility, and we are still amazed and grateful. Here is the sermon I preached in November 2005 when we dedicated the newly-renovated facility. An accessible building is only half the story. We must also let God remodel us as a people. The friends in our gospel lesson today were filled with caring, and filled with hope. Oh, if only their friend with paralysis could see Jesus’ kind eyes, and hear his gracious, forgiving voice and receive the touch of Jesus’ healing hands! Somehow, they were going to get him to Jesus! The man’s needs were many, spiritual as well as physical. He knew that, at best, most people around him pitied him. In that day almost everybody believed that disability had to be the result of somebody’s sin, whether it was the man’s own sin, or that of his family. It is not fun to be pitied. It is not fun to have to let people help you. But if the man wanted to go anywhere, that’s what he had to do. He was fortunate to have friends of faith. He must have had faith and hope, too, at least enough to put himself into his friends’ hands, and let them give it a try and carry him to Jesus. You’d think the crowd would make a way for someone in obvious need, but they didn’t. I don’t know why. Maybe they just didn’t think it was important. Maybe they just didn’t want to go to the trouble of rearranging themselves. The man could wait until Jesus had finished speaking. He could see Jesus later. The man and his friends consulted with one another. What should they do? Wait? Come back another day? There is no question. As 1 Corinthians 12 puts it, all the members of the body of Christ are necessary for its healthy functioning, and that includes people who have disabilities. We’re not talking about ministry TO but ministry WITH people with disabilities as disciples of Jesus together. Here is an article excerpted from a new book entitled Amazing Gifts: Stories of Faith, Disability, and Inclusion by Mark Pinsky, published by the Alban Institute. I’ve already read one story from the book in Alban’s journal and look forward to reading the whole book. 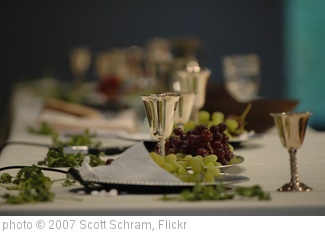 Here is a communion sermon that focuses on inclusivity in the body of Christ and at his table. 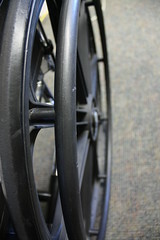 It is another in my series of sermons on themes related to disability. I preached this in 2005 as our church’s new accessible fellowship hall–our dining room–was being completed. Mephibosheth was afraid. He trembled when he came before King David. The behavior of his grandfather Saul, first king of Israel, had cast shame on the whole family. Moreover, David had done what kings predictably did: eliminate anybody who might try to claim the throne. Mephibosheth’s fear was perfectly understandable. But how sad that the felt he had to put himself down in so ugly a way in the king’s presence. He referred to himself as a dead dog, an epithet meaning worse than scum. Dead dog equals yuck! Unclean! Mephibosheth had had a hard time. Now about twenty, he had been living with mobility impairment since he was five years old. The accident had occurred when news reached the household that his father Jonathan and grandfather the king had both died in battle. The family was in danger. As they hurried away, Mephibosheth’s nurse dropped him. Most likely he suffered broken bones. Both feet were crippled. Without any modern techniques of setting and repairing bones and treating infections, people who survived fractures often ended up with lifelong deformity and lifelong disability. And unless their family had means, that also meant lifelong poverty. And it meant shame. Most folks believed that tragedies like this didn’t happen to you unless you somehow deserved it. Religious law reinforced the shame and stigma. For example, people with disabilities or even certain conditions we would consider minor were forbidden from serving as priests. Only unblemished males were considered good enough to serve God in this way. Anything less was an insult to God. The body of Christ is not whole without all its parts. 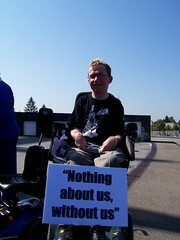 That also means it is not whole without Christ’s disciples who have disabilities. 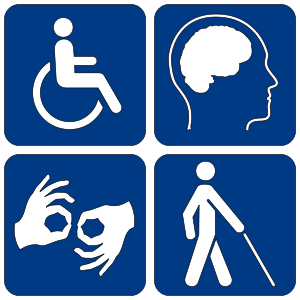 Here is another sermon in my series on disability. I don’t think the congregation at Corinth intended it to happen, but some church members found themselves feeling unneeded, unimportant, and unwanted. How did this happen? Just like people in the world around them, the Corinthians were preoccupied with where they stood on the social ladder, the status ladder, and the authority ladder. Who was strong, who was weak, and who was somewhere in the middle? Some claimed that a special allegiance to Paul, or Apollos or Peter placed them on the upper rungs of the church. Others asserted that their superior spiritual gifts placed them at the top of the ladder. Now consider what this meant to those who didn’t have special connections and flashy gifts. This state of affairs—division—was even apparent at the communion table, THE place where divisions are supposed to disappear. In Corinth, the Lord’s Supper was celebrated along with a regular dinner. Reflecting the Corinthian social ladder outside the church, wealthier church members enjoyed lavish meals before the poorer working class people even arrived. Just like the first-class passengers on an airplane, the upper class church members enjoyed better food, and those who didn’t have such resources were put to shame. Some were completely left out. There wasn’t a place at the table for them. They went home hungry. With all this judging and comparing going on, no wonder some of the church members were labeled weak. They may have even labeled themselves weak, second class, not valuable, not needed. Our congregation has been working the issue of accessibility for people with disabilities for a long time. We still have a way to go, but we’ve come a long way, too. It’s a two-fold process. We need access ramps into our church buildings, and we also need access ramps into our hearts. We need to widen the doors of our church buildings, and we also need to widen the doors of our hearts. From time to time I will post sermons, thoughts, or resources related to accessibility and disabilities. To start the series, here is the sermon that I preached in 1995 on Morton Church’s first Accessibility Sunday. I am sure that the statistics I cited then need revision, but the need is as strong as it ever was–perhaps even stronger. One Sabbath day Jesus went home to dinner with a leading Pharisee of the local congregation. Now this was not a spur of the moment potluck. The host had put every bit of effort into getting ready for Jesus that we put into getting ready for our annual homecoming. It was a matter of honor to put on the finest feast he could, and the more important the guest, the more elaborate the feast. The host put his head together with the cook about the food, just as we do every September. The food had to be tasty and there had to be enough of it and more. There was a special item on the menu: meat. It was too expensive to eat every day. The host carefully instructed the servants how to lay the table and where. They must make comfortable places for the guests, and especially for the guest of honor. We know how important that is! Every year we worry about our guests getting too hot outside, and we debate about the best place for the tables. Last year we went all out and got a big tent to dine under. Just as we do, the host probably planned a program for the guests to enjoy. He also sent out invitations by way of the servants. In his time, you invited your guests twice: once to announce the meal, and then again when the meal was ready. Last year, over one hundred people accepted our invitation to come home to Morton, and we had a grand feast! At last the dinner hour arrived, and the Pharisee’s table was piled high with good things. After all the guests had gotten settled, Jesus looked around at everyone. He found himself looking into the faces of the host’s family and friends, the neighbors and the influential people in town. Jesus also noticed who wasn’t there, who hadn’t been invited to the party.